US economist Richard Thaler, one of the founding fathers of behavioural economics, has won this year's Nobel Prize for Economics. Judges said he had demonstrated how "nudging" - a term he coined - may help people to exercise better self-control. He will receive 9 million Swedish krona (£850,000) from the committee. "I will try to spend it as irrationally as possible!" the 72 year-old economist said. 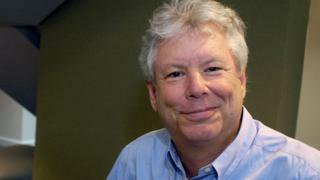 Prof Thaler's work led to the UK setting up a "nudge unit" under former prime minister David Cameron. It was launched in 2010 to find innovative ways of changing public behaviour and has offices in the UK, New York, Singapore and Sydney. One of the Nobel prize judges, Per Stroemberg, said Prof Thaler's work had explored how human psychology shaped economic decisions. "Richard Thaler's findings have inspired many other researchers coming in his footsteps and it has paved the way for a new field in economics which we call behavioural economics," Mr Stroemberg said. The panel said Prof Thaler's insights helped people to recognise marketing tricks and avoid bad economic decisions. In particular, his work looked at how to "nudge" people into doing more long-term planning, such as saving for a pension. Prof Thaler also made a cameo appearance in the Hollywood film, The Big Short, explaining the complex financial instruments that led to the financial crisis of 2007 and 2008. It is the final Nobel to be announced this year, after prizes for medicine, physics, chemistry, literature and peace were awarded last week. The economics prize is the only Nobel not created by Alfred Nobel, and was instead launched in 1968, long after the philanthropist's death. To date the US has dominated the prize, with American economists accounting for roughly half of laureates since it started. Between 2000 and 2013, US academics won or shared the prize every year. Last year, UK-born Oliver Hart and Bengt Holmstrom of Finland won the award - officially called the Sveriges Riksbank Prize in Economic Sciences in Memory of Alfred Nobel - for their work on contract theory. Prof Thaler's central insight is that we are not the rational beings beloved of more traditional economic theory. Given two options, we are likely to pick the wrong one even if that means making ourselves less well off. Lack of thinking time, habit and poor decision making mean that even when presented with a factual analysis (for example on healthy eating) we are still likely to pick burger and chips. We're hungry, we're in a hurry and burger and chips is what we always buy. Nudge theory takes account of this, based as it is on the simple premise that people will often choose what is easiest over what is wisest. Tests have shown that putting healthier foods on a higher shelf increases sales. The food is more likely to be in someone's eye line and therefore "nudge" that person towards the purchase - whether they had any idea about the obesity argument or not. Read more from Kamal's blog.